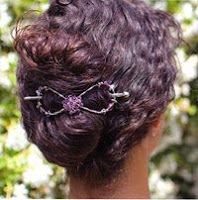 Lilla Rose has the most awesome hair product I have ever used, the Flexi Clip! No more headaches, no more pins, no more plastic claws! Our Clip is different from other hair accessories because of the following features: Our clip is ornate: beautifully designed in a multitude of colors; it is amazingly flexible which most items of it’s kind are not; it is one-piece so you do not have to worry about losing a piece of it; the Flexi Clip is also very durable and finally, it locks so the pin does not slip out. Our flexible clip will fit in just about any thickness of hair. We have six sizes: mini’s, extra small, small, medium, large, and extra large. My hair is silky and of medium thickness. Pony tails can give me headaches. Barrettes would end up falling down leaving me constantly re-doing my hair. Unless my hair was wet it would slide out of most claws or droop. Again leaving me needing to re-do the hair throughout the day. The Flexi Clip’s provide stylish pain free hair do's for everyday, and elegance for special occasions. Visit the website for instructional videos that show eight beautiful hairstyles, and explain what Flexi clip you could need for your hair. It’s simple. It’s beautiful. It’s affordable. I love it! Enjoy your visit, while finding the Flexi Clip that works best for you! I was pumped to receive the opportunity to review a Lilla Rose Flexi Clip...I have LONG, THICK hair and NOTHING ever seems to work the way I want it to!! I want to be able to grab, twist and stick something in my hair and keep it all in place without too much muss and fuss!! 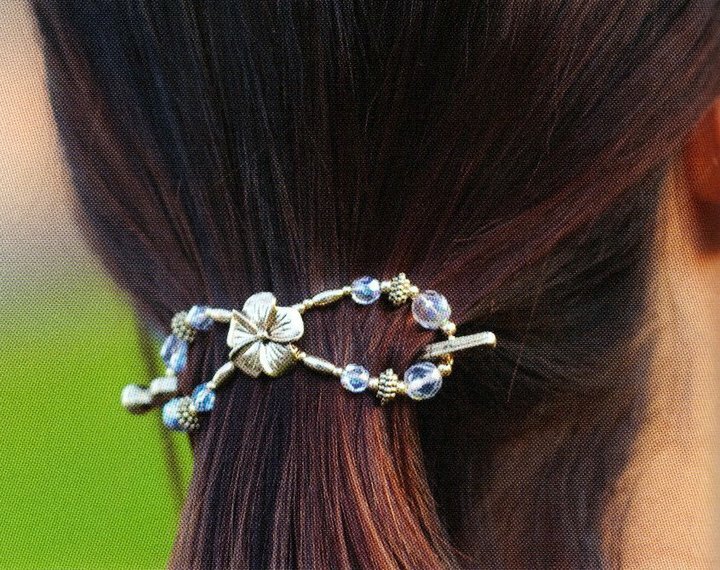 AND...I want it to look nice...with the Lilla Rose Flexi Clips I get EXACTLY what I am looking for in an hair accessory~!! Not only are they GORGEOUS but they are simply the easiest clip to put in your hair...EVER~!!! I've twisted my hair into numerous designs and have been able to place the clip anywhere...its just that simple to use~!! The compliments I have been getting over my new hair accessory have been outstanding and I have been bragging Lilla Rose up to everyone who wishes to listen~!! They are easily affordable and look great for ANY occassion!!! Weddings, graduations, or just to head out to the grocery store, they are beautiful wherever you wear them~!!! The hardest thing about them is making a choice when you head over to the Lilla Rose site, there are hundreds of these beauty's to choose from in assorted sizes for all hair types...I bectcha can't choose just one!! And now, One Day At A Time and Lilla Rose Flexi Clips wish to give one of our readers the chance to win one of their very own...all you have to do is enter~!! Mandatory Entry - Go to htpp://www.lillarose.biz/ClassicBeauty and tell what style you like best! Optional Entries - To increase your chances of winning, do any of the following and leave a comment on this post telling me what you did. Each comment is worth one entry so make sure and leave a separate comment for each one you do. Please make sure you leave a valid email address so that I may contact you if you win! If you are tweeting you may use the following tweet:. Giveaway begins Sunday May 8th, 12:01 a.m. (EST) and ends on Sunday, May 22nd midnight (EST). This contest is open to the US and Canada. The winner will be selected at random.org and then announced on One Day At A Time and contacted via email. The winner will then have 48 hours to respond before a new winner is selected. I like the Eternal Infinity Motif hair clip in size medium. I follow One Day At A Time via GFC. I love the extra long hair style. My favorite style is the Flexi O-Rings. I Twitter follow One Day At A Time. I love the mighty celtic knot style. And I think I'd get a medium... I so want one of these! I like Lilla Rose on FB #1. I like Lilla Rose on FB #2. I like the flexi large and the hair sticks!! I emailed friends and family about the giveaway! I like the Beaded O-Ring - Extra Small size! One Day at a Time public GFC follower Rae T. (Auqakuh). Mad Moose Mama public GFC follower Rae T. (Auqakuh). One Day at a Time Facebook fan Raegen T.
I sent Jennifer a Facebook friend request as Raegen T.
I'm your twitter follower @rararomp. #1 Lilla Rose twitter follower @rararomp. #2 Lilla Rose twitter follower @rararomp. #1 Lilla Rose Facebook fan Raegen T.
#2 Lilla Rose Facebook fan Raegen T.
I entered this before the 13th but it was one of the comments that disappeared. I like the Beaded O-Rings for my daughter. 1-1615 Open Heart Dangle is my favorite! My granddaughter would look good with the clip.